Here at Von Anthony Salon, we have created a beautiful canvas to help you achieve your dream hairstyle. We are dedicated to our craft and committed to meeting the needs of our guests. Our mobile app now promises to deliver this same level of service and commitment to excellence from your very own mobile device! It’s free, easy to use, and just like having your own miniature receptionist right in the palm of your hand. 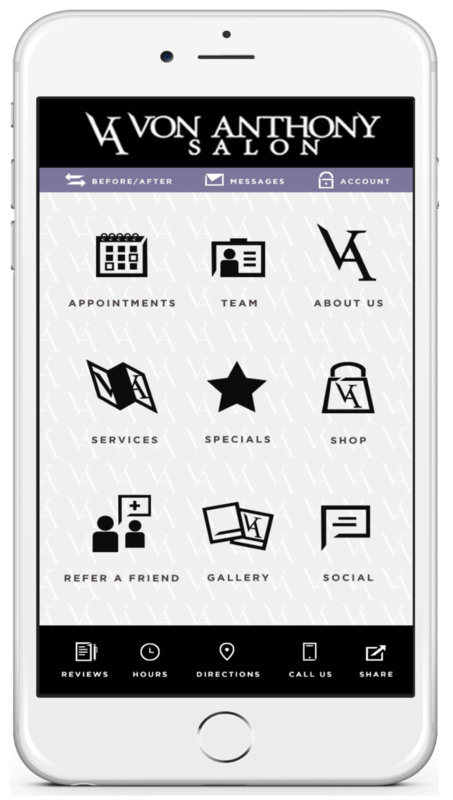 With our app, you have quick access to our salon menu where you can browse our products and services, keep up with our current specials, read client testimonials, view our gallery, and even access our blog to keep up with the latest news! If you’re looking for even more reasons to love our app, you can also do your shopping right at your fingertips. Purchase salon products or a gift card for that special someone and give them the gift of Von Anthony Salon. Gift cards can be used for products and services, and we’ll even send it directly to the recipient. Get directions to the salon wherever you happen to be at the moment and enjoy many other benefits from our free mobile app. You can find us at 7004 Lebanon Road, Ste 102 in Frisco, or call us on 972-731-7600. At Von Anthony Salon, we are ready to help you create the new hairstyle of your dreams. If you’re ready to download our free mobile app, find it today on iTunes, Google Play, or Amazon.